Mission Investors Exchange, the leading impact investing network for foundations dedicated to deploying capital for social and environmental change, has featured our CASE Smart Impact Capital toolkit as part of their recommended tools and resources for their over 200 philanthropic members. Launched in October 2017, Smart Impact Capital is the first online toolkit for professional impact investing training, relevant for investment in nonprofit and for-profit enterprises, at any stage, any impact area, in any industry. It has been licensed by more than 25 distribution partners and accessed by over 12,000 people in over 100 countries. Current partners include networks (SOCAP, Social Enterprise Alliance), accelerators (Uncharted, Spring, ImpactHub Johannesburg), universities (Duke, Stanford, MIT), and funders (Cordes Foundation, Investors’ Circle, USAID), among others. What’s in the toolkit for funders and foundations? Any funder who wants to understand what to consider when looking at investment directly into a social enterprise can benefit from this set of highly rated tools. 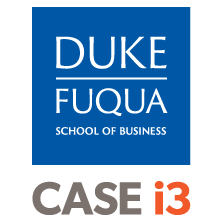 Developed by CASE at Duke over three years, Smart Impact Capital incorporates the insights and best practices from hundreds of entrepreneurs, funders, investors, legal sources, and accelerators around the globe. Nine 1-3 hour modules of videos, guides, and interactive exercises that help entrepreneurs and funders understand the why, what and how of the direct impact investing process. The toolkit also includes over 18 unique decision tools, a term sheet library of actual impact investor term sheets, a due diligence flowchart and a guide to tough situations. Once you register, you have access to all of it. For more information, visit CASE Smart Impact Capital. The toolkit can be purchased individually online, or under our group discount program. This entry was posted in CASE Publications, News and tagged CASE Smart Impact Capital, debt, due diligence, education, equity, grants, philanthropy, PRIs, private equity, SIBs, socent. Bookmark the permalink. ← Want to be an academic influencer on social media? Here’s how.